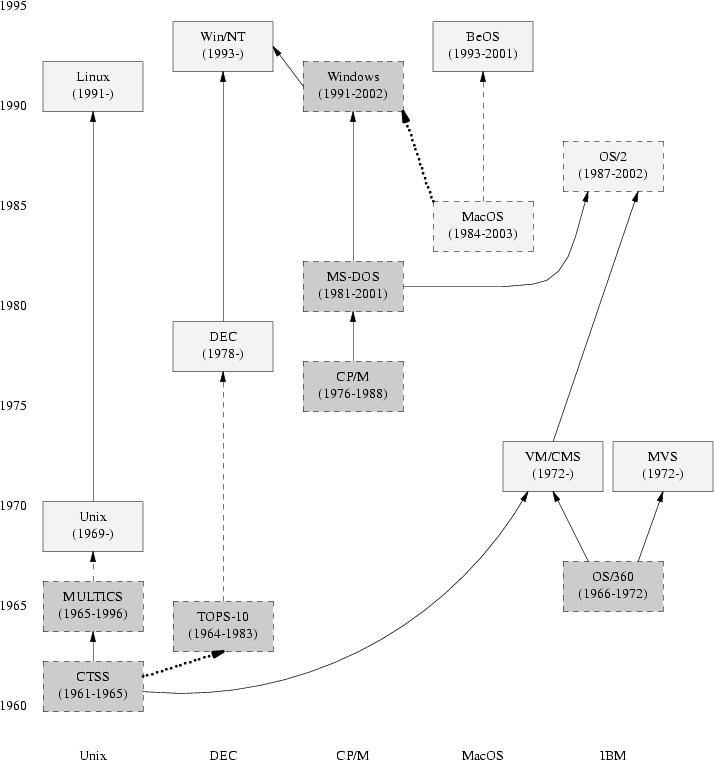 Figure═3.1 indicates the genetic relationships among the timesharing operating systems we'll survey. A few other operating systems (marked in gray, and not necessarily timesharing) are included for context. Sytems in solid boxes are still live. The ‘birth’ are dates of first shipment; the ‘death’ dates are generally when the system was end-of-lifed by its vendor. Mac programmers tend to design in the opposite direction from Unix programmers; that is, they work from the interface inward, rather than from the engine outward (we'll discuss some of the implications of this choice in Chapter═20). Everything in the design of the MacOS conspires to encourage this. OS/2 began life as an IBM development project called ADOS (‘Advanced DOS’), one of three competitors to become DOS 4. At that time, IBM and Microsoft were formally collaborating to develop a next-generation operating system for the PC. OS/2 1.0 was first released in 1987 for the 286, but was unsuccessful. The 2.0 version for the 386 came out in 1992, but by that time the IBM/Microsoft alliance had already fractured. Microsoft went in a different (and more lucrative) direction with Windows═3.0. OS/2 attracted a loyal minority following, but never attracted a critical mass of developers and users. It remained third in the desktop market, behind the Macintosh, until being subsumed into IBM's Java initiative after 1996. The last released version was 4.0 in 1996. Early versions found their way into embedded systems and still, as of mid-2003, run inside many of the world's automated teller machines. NT systems on the Internet are notoriously vulnerable to worms, viruses, defacements, and cracks of all kinds. There are many reasons for this, some more fundamental than others. The most fundamental is that NT's internal boundaries are extremely═porous. The goal of subsuming the competition, combined with the drive to reach the end-user, has motivated Linux developers to adopt design ideas from non-Unix operating systems to a degree that makes traditional Unixes look rather insular. Linux applications using Windows .INI format files for configuration is a minor example we'll cover in Chapter═10; Linux 2.5's incorporation of extended file attributes, which among other things can be used to emulate the semantics of the Macintosh resource fork, is a recent major one at time of writing. These trends have implications for the future of Unix as a whole, a topic we'll return to in Chapter═20. Microsoft actually admitted publicly that NT security is impossible in March 2003. See═http://www.microsoft.com/technet/treeview/default.asp?url=/technet/security/bulletin/MS03-010.asp.